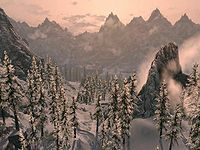 Dunmeth Pass is the main pass and one of the few traversable roads leading through the Velothi Mountains between northwestern Morrowind and eastern Skyrim. On the Morrowind side it is found near the city of Blacklight and in Skyrim it emerges from the mountains near the city of Windhelm. It historically served as a significant avenue of trade for Windhelm, although traffic has likely diminished since the Red Year. This page was last modified on 21 October 2018, at 07:37.